I've written about migas before, but it was migas en salsa verde. Today I didn't have any salsa verde. What I did have was leftover classic tomato and chile salsa, leftover carnitas, leftover queso chihuahua from Gringa Dairy, and some tortilla chips (totopos). One of my favourite things to do with leftover salsa is fry it for a few minutes and then scrabble eggs in it. It basically makes huevos a la mexicana, but without having to dice the onions, chiles, and tomatoes first thing in the morning. This morning I fried the leftover carnitas in butter (to keep it healthy), added the salsa, and then scrabble the eggs. 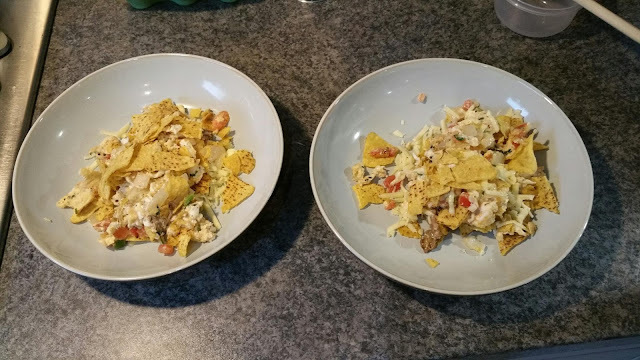 When the eggs were just cooked, I crumbled the tortilla chips in, then topped with queso chihuahua (Mexico's melting cheese). One the many great Mexican breakfast dishes.